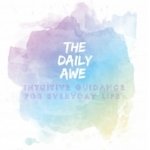 SIGN UP FOR THE DAILY AWE EMAIL UPDATES AND RECEIVE "AURA READING: 101" FOR FREE! Have you ever had a “stranger” who felt familiar to you visit you in your dreams? Someone who feels like you know them but you can’t quite place how or maybe even feels like a best friend, but you haven’t a clue who they are in your waking life? If you have ever dreamt of this familiar “stranger,” this is most likely a spirit guide coming to you in your dreams.